Partan at the Isle of May. Newcomers welcome! Contact us for dates and times of our next open session. Taking Partan out to sea for the under 17's race, Brochie the dog 'helping'. 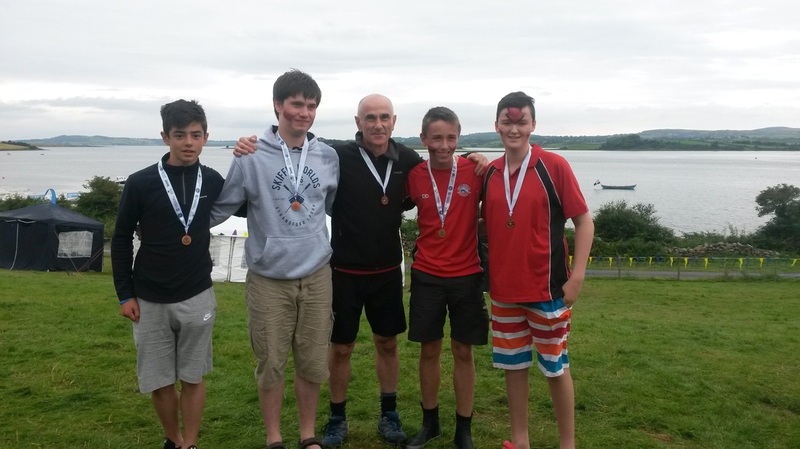 A small group of fourteen adults and four youngsters from Crail Rowing Club took on the world’s top coastal rowing clubs at the second Skiffie Worlds held on Strangford Lough, Northern Ireland. 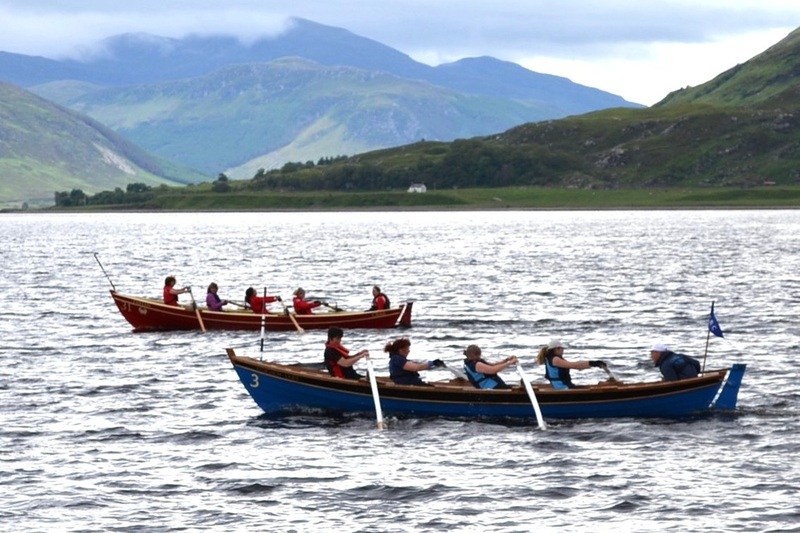 The championships are held every three years and organised by the Scottish Coastal Rowing Association (SCRA). ​Delamont Country Park on the shores of Strangford Lough was host to over forty clubs from Tasmania, Canada, Holland, USA, Scotland, England and Northern Ireland, who competed over the 2km race course. In the heats, with up to 35 entrants, Crail successfully qualified in all but one of their categories, subsequently racing in 13 finals. With each final comprising the top 15 clubs, every race was closely fought, often with barely a boat-length separating the leaders. 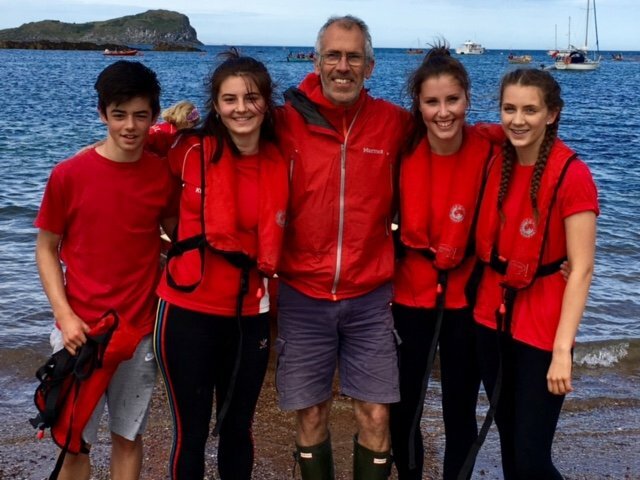 Conditions varied throughout the week, if not every hour, from bright sunny spells and calm waters to heavy showers, squalls and whitecaps, adding to the excitement and challenge. As the week progressed Crail made their mark, achieving high placings in the finals and often finishing in the top four or five. However, the best was yet to come. In the Ladies 40+ category, consistently one of the most subscribed and competitive races in coastal rowing events, Crail, alongside Eastern Amateur Rowing Club, Anstruther and North Berwick led a close field with little between them. However, with 250m remaining and the finish line in sight, Crail’s ladies dug hard into the head wind. Pulling away, they left the strong favourites in their wake to win gold and become World Champions with a massive 16-second lead. Topher Dawson, a founding member and leading light in the SCRA, commented that it was the most beautiful finish he had seen. The Mens U17 event followed and Frank Fry, borrowed by North Berwick to complete their crew, was awarded a bronze medal in the 1km race. On the last day, Crail’s Mixed 40+ team also took bronze, crossing the line in 12 minutes 21 seconds, in an exhausting battle, five seconds behind winners, Eastern. The very last race of the championships, the Mixed 50+ final, saw Crail ending on yet another high, taking silver in a nail-biting finish just three seconds behind winners Sketrick from Northern Ireland and one second ahead of Cornwall team, 4 Pilchards. With points awarded for each club’s best eight races, the overall Championship winners were local County Down club, Dundrum, with Crail coming 6th equal with Coigach, (world champions 2013), out of the 41 competing clubs. The East Neuk was well represented at Skiffie Worlds. Congratulations go to Anstruther for their fantastic achievement, winning two gold, three silver and three bronze medals, and coming a well-deserved fourth overall. Despite being few in numbers, Pittenweem, having entered five categories, were delighted to qualify for two finals. A thoroughly enjoyable week was had by all and Crail Rowing Club are extremely proud of their achievement and to have represented Crail on a global stage. The club would like to thank everyone in Crail for their support and good wishes. If anyone is interested in having a row or becoming a member, please see our website http://crailrowingclub.weebly.com or contact David Fraser on 01333 450217 or Jude Fry on 01333 451066. Frank (left) with North Berwick under 17s team and Bronze medals. Frank Fry receiving his Bronze! Following a winter refit and general 'buffing up' in the boat shed, Partan finally emerged blinking into the cold light of day, and was ceremoniously baptised in Crail harbour. Two teams of both new and seasoned rowers took her out on a couple of sea trials, during which she performed admirably. Lean forward, ready to row.....! Luckily the plugs are firmly in place. Out to sea for the first row in 2016. Racing in 'Fisher Lass' at the Freshwater sprints in 2015. Crail Mens Open team battling into second place, Broughty Ferry Regatta 1st August 2015.